Since I was eager to create a YES space for my Isobelle, I hurriedly look online on where to order some of the educational toys that can be useful aside from the ones I have. 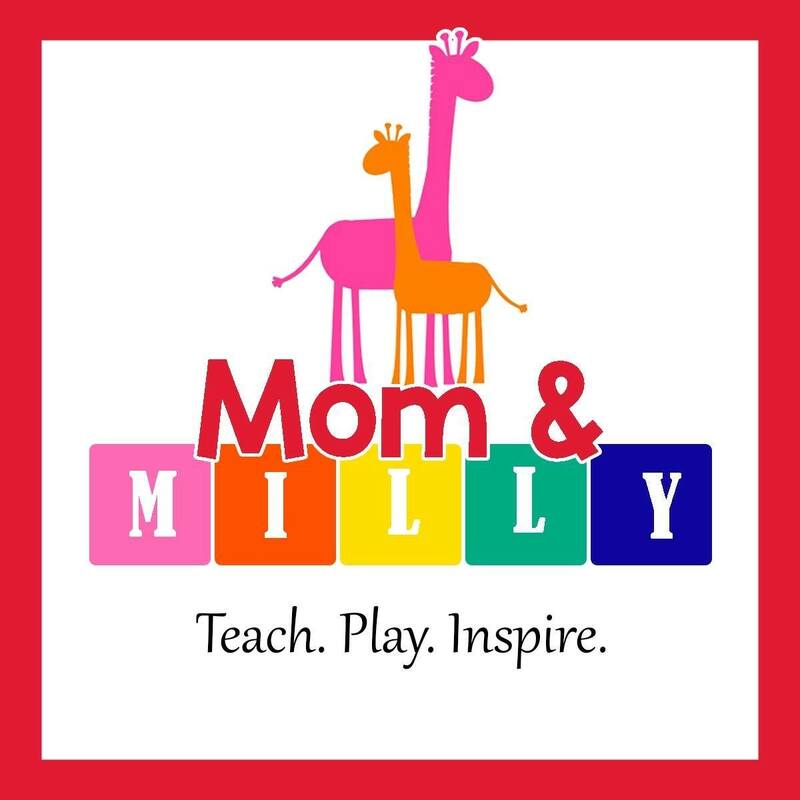 I immediately search through facebook for online shops and luckily I found Mom and Milly Educational Items. Though I am still looking for far more cheaper than this and still thinking if is really necessary because of its height, I still choose the easel board. 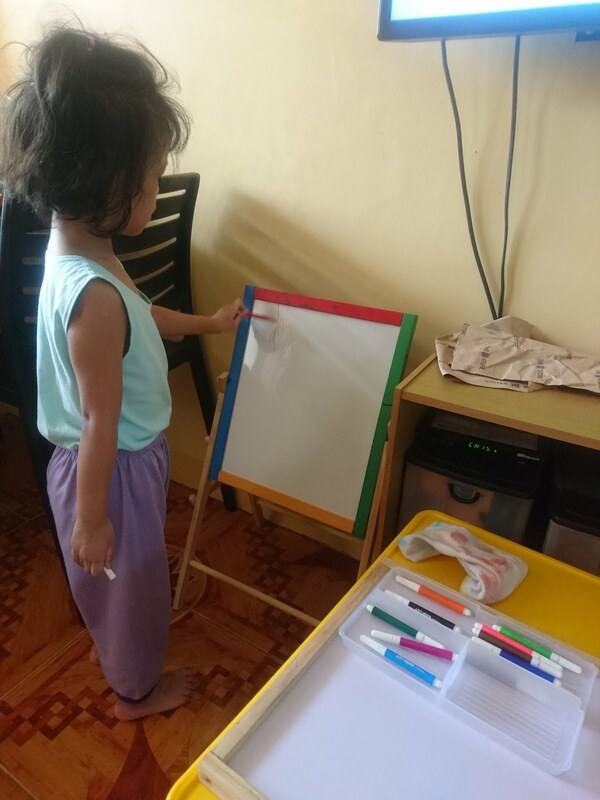 It can be use as chalk board or the whitemarker board. It also includes chalk, whiteboard marker and eraser. We were able to use it for quite some time but right now the whiteboard is detrimental to its overusage. We cannot fully erase the marks anymore. Not as white as ever. If you happen to know how to effectively clean a whiteboard, please let me know. Also, the side screws are a bit loose already. So I am reminding everyone that if ever you are gonna purchase this board please do not change or adjust it always. One of our screws give up already so we glued it pansamantagal. Update: I was using the board for the washable markers/pens. We just use a wet rug to erase what we write on the board. Among the purchase, this one is our favorite. 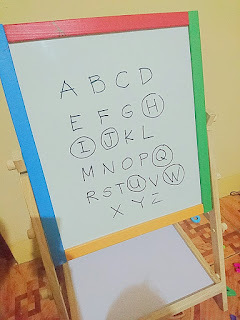 We are still using it and Isobelle loves to learn from it. 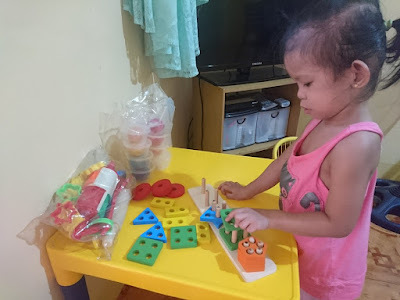 Because she can identify shapes and colors, as well as count it and sort it. It's easier to use compared to the colorful geometric we have here locally. Plus the size is not too small nor too big. 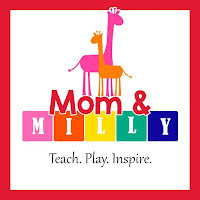 I am recommending this product if you want to teach your little ones 4 aspects with just one toy. I am expecting that we can use it for a long time but I failed solely on how to store it. First, the parcel came and the containers have cracks already so the moisture and freshness of the dough is not well. I left it just like that simply because there is no definite instructions on how to properly store it. After a week, the dough started to have molds on one the dough we have. So I have to throw it already. Other colors follow through so at the end of the month we have no dough left on hand. I ordered the kit along with the tools but the roller handle is also destroyed with just a little force on it. One rollers have detachable parts and it's not useful too because it keeps on loosing. I didn't enjoy using it. I might bought a playdoh instead. Update: I bought a playdoh and use the tools from Mom and Milly. Our favorite tools are the shape molders. So thats how we got some educational toys for Isobelle's YES space. I manage to buy toys that are not the same. I have wooden, plastic, puzzles, pegs and sorting materials. You can create a YES space too, and even purchase cheaper but useful ones to enjoy your activity with your kid.